लोडशेडिंग! लोडशेडिंग! के लेखुँ यी महासयको बारेमा? यो शब्द घरको छानामा घिरौला झुन्डेझैँ झुन्डेको छ- लोडशेडिंग! नेपालबाट '' जय लोडशेडिंग'' राख्दे कति जाती हुने थियो, कुरै नगरौ ! 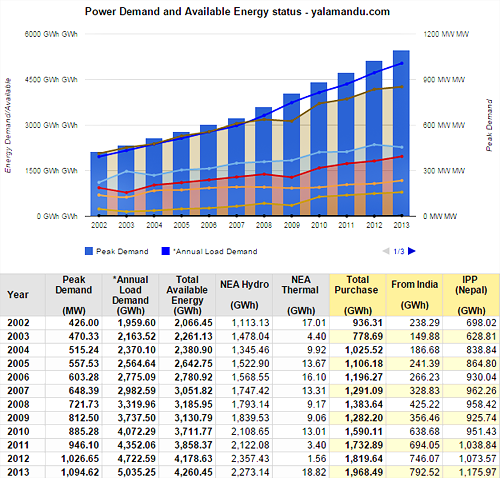 Statistics and graph of Available Energy, Power Demand, and Distribution of Power Supply during the past 10 years in Nepal. Load-shedding will take place on the given time inside the Kathmandu Valley and 5 minutes after the given time outside the Valley. Depending upon the condition, load-shedding could increase/decrease by one hour. For Lamahi and areas west of it, and for Duhabi and Anarmani Sub-stations, Nepal Electricity Authority will publish the load-shedding schedule at local level. Loadshedding goes up again from 9hrs a day to 12 hrs per day. Before, power outage was around 7 hrs per day. The worsening political situation our country in addition to the dry weather had led to the increase in the daily load shedding up to 7hrs per day. Before, power outage was around 4 hrs per day. Power outage, commonly known as load shedding, has come down to 3.5 hours per day from Tuesday onward, according to Nepal Electricity Authority. Earlier, power outage stood at 5 hours per day. In rainy season, power outage drastically reduces, while in dry season, it swells up to more than 14 hours per day. As per the new schedule consumers, who have been facing up to 12 hours of daily outage, will now face 10 hours of daily load-shedding. NEA said the new schedule was made public as Kaligandaki 'A', which was shut for a month for repairs, started generating power. It also said that the decision was take in view of this year's SLC exams. The Nepal Electricity Authority (NEA) has slashed the load-shedding by two hours a day effective from Sunday. hough the power outage had been reduced from Wednesday unofficially, NEA announced the changes in the load-shedding schedule from Sunday citing the smooth supply of electricity from India. The load-shedding will be 12 hours a day. Nepal Electricity Authority (NEA) has unofficially reduced the load-shedding hours. The load-shedding hours have been reduced on a trial basis without issuing revised schedule after the supply of 25 Megawatt power from India resumed, NEA said. According to the authority, the load-shedding timetable could be changed based on the supply of electricity by India. 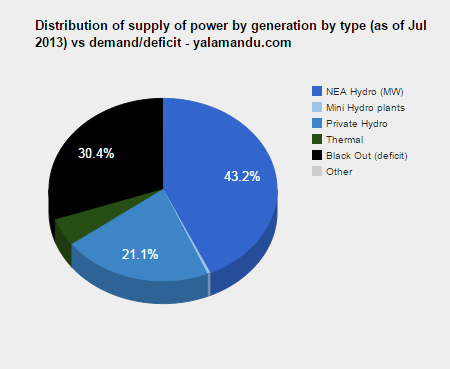 The NEA had increased the load-shedding hours to 14 hours a day from Saturday. India is preparing to supply additional electricity to Nepal in order to help the Himalayan nation deal with the acute shortage of power during the winter season. Indian External Affairs Minister Salman Khurshid informed about efforts towards this end during his call on President Dr Ram Baran Yadav on Wednesday, according to reports. Khurshid told Nepal’s President that short term measures to augment grid connectivity of 40- 55 MW were completed and that India is working on plans to further increase this is in the medium term, PTI reported. With the advent of winter season, Nepal is currently facing an acute power shortage with consumers in the country facing up to 12 hours of power outage on a daily basis. During the meeting, the Indian External Affairs Minister also conveyed India’s wish to see “a stable, secular and democratic Nepal”. President Yadav and Khurshid also discussed the latest political situation of Nepal. On the occasion, Khurshid said that India would welcome whatever consensus emerges among Nepal’s political parties while President Yadav thanked him for India's development assistance provided to his country, according to reports. President Ram Baran Yadav started hectic political meetings in New Delhi on the third day of his India visit on Wednesday. President Yadav met his Indian counterpart Pranab Mukherjee at the latter's office in Raisina Hill in the morning. He also held separate meetings at his hotel suite with ruling Congress party chairman Sonia Gandhi, general secretary of Indian Nationalist Congress D.P Tripathi, CPI (Marxist) leader Sitaram Yachuri and Congress (I) general secretary Janardan Dwibedi. Nepal Electricity Authority has increased the number of load-shedding hours to 14 hours a day, from Saturday. The outage hours was increased to 12 hours every day on December 26. NEA said it decided to increase the power outage hours from 84 hours per week to 97 hours per week due to abrupt cut in import of power and shrinking water levels in rivers. NEA has been forced to revise outage hours as the Bihar Electricity Board abruptly decided not to supply 70 MW of electricity to Nepal. Nepal Electricity Authority has extended daily power cuts by two more hours without informing the public. The power outage was increased to 69 hours per week from 49 hours on December 8. The news comes as members of the general public reported that they were facing more than 69 hours of weekly power cuts in the past week. A section of the local media has said that the government did not want to inform about the power cut hoping the import of 40 MW from India from January 1, 2013. Nepal Electricity Authority (NEA) has decided to increase the load-shedding hours for the second time in the past 10 days. The new load-shedding regime will come into effect from December 8 (22nd Mangshir, 2069). The state-monopoly on supply of electricity has hiked the load-shedding hours by 14 hours to make it 70 hours a week from the existing 56 hours. This means that consumers will now have to face 10 hours of daily power cuts from Saturday. NEA has said reduction of water level and flow in the rivers with the onset of winter has severely depleted its capacity to generate more electricity and made it mandatory to increase load-shedding. NEA officials have been saying that consumers may have to face up to 19 hours of daily power cuts this winter.